With runoff slowing...look for the Corps to begin to slowly cut back the release from Walter to more of a fisherman-friendly release. The reason for the cut back in cfs being released is due to the fact the lake is just about at 1,370', and the Corps Recreation Plan for 2008 calls for the level to stay at or below 1,370'. Therefore the outflow from Walter for the most part will pass inflow in order to keep the lake level steady. For all intents and purposes anything stored above 1,370' is an encroachment into the flood control space. And with a non-whitewater weekend coming up, and not much rain in the forecast, the levels should be dialed-in to a nice fishing level this upcoming weekend. The charts above can be found online at the Corps Philadelphia office website - - definitely worth a bookmark! Should be a good fishing stretch coming up - - we will be on the water a handful of times over the next few days so look for a report most likely early next week. If you are on the water, look for sulphurs, caddis, olives and some leftover march browns. Get out there, and enjoy it! A very quick report for ya...the water is low, and the fishing is tough. Low flows of the D mean very little sanctuary water - - so day after day the trout are getting pounded. The fish just can not escape. Right now it is best to just wade fish the system - - both the West and the Main. Look for apple caddis, march browns, brown stones, sulphurs and maybe the start of the drakes. Don't forget your red brown spinners. The algea is bad this year for some reason (West Branch especially)...so check your fly consistantly. And do what you can to prevent the spread of Didymo. The consistent rains of late have really kept the rivers and larger streams at some great levels. FFPA will take higher than normal water (with-in reason), over low-water any day! Plus it gives the fish a break during a timeframe when us fisherman would otherwise be hammering them. Let them eat in peace we say! Well, at least for a little while. Anyway, these April-like flows bode well for the early-summer.... just as long as Mother Nature does not go schizophrenic on us. Regardless, get out there and enjoy the holiday weekend. The fishing should be phenomenal! We've been on the river the last few days and have found some pretty decent fishing - - you did have to work for your fish though. We had cool air temps, cold water temps (53-56F), rain, rising (see below) and off-color water working against us. What we did have working for us though was a good number of hatching bugs. Interestingly - the Sulphurs have started...and they were out is big numbers during the rain. We also have been seeing small olives, tan caddis, a few small stones, grey foxes and march browns. During the daytime hours, when the water clarity was the best, the fish were plowing down our Maddie Wet. This imitates the large emerging grey fox or march brown. These fish are currently smashing this fly! And as mentioned in the May 6 report our hooks continue to get compromised. We are going to need to look into this before the next tying sesh. Also, don't forget swinging those brown buggers w/ rubber legs. Bigger is better when it comes to the LR. While fishing the off-color water, lead, and lots of it, was the key. Combine that with some hard mends, to get the fly down even more. One of a couple of browns Gary picked up. Ted showing off some Lehigh Silver! Greg with a fat smallie! As of writing - the Corps has posted a 350cfs release from FE Walter for the weekend. Only if there is heavy precipitation in the headwaters of the Lehigh should there be an update to the release web page. Look for the update sometime on Friday. For a frame of reference, the Lehigh doubles in size (GENERALLY SPEAKING) - - due to trib influence - - by the time it hits the Lehighton gage. At this level the Lehigh does push, but yes, there is still plenty of places to get out, wade, flail, and find rising fish. Be sure though to wear your studs, and don't forget that wading staff. Look for march browns, olives, tan caddis and maybe even the start of the sulphurs. Swing some large wets as well as those always productive buggers. Simple, but effective patterns - - just the way we like it! We still have dates available for Lehigh Floats. We had out Rick again on the Tully over the weekend. Rick fished the Tully last year as a first timer, and did very well. This year we looked to build upon the foundation of information he retained from last year - - which we did -- but the fish did not really want to cooperate all that much. Feeding activity was slow for the most oart, while angler pressure was heavy. For instance in one stretch of very nice water which we worked over big-time, with tried-n-tru imitations, we did not get a hit. Final tally was about a half-dozen fish stuck or rolled - - none of which came to hand. Best patterns for the day were caddis pupa, nitros, and a #16 green caddis elk hair imitation. FYI: Word is the sulphurs have begun to pop here in SE PA. See you on the water! SE PA fly waters like Ridley and Valley have yet to see the yellowish mayfly poke through the surface. And with the impending weather forecast, who knows when we might begin to see them. What will be interesting is if the latter of the two waters mentioned above will even have a hatch this year. Recent rock rolling over at Valley revealed no sulphur nymphs at all - - at least in the tiny piece of water sampled. Even is there are some left, look for a short and sporatic at best appearence. Weather/water levels pending we hope to hit it in the coming days. Quick report for ya...the bugs still have not got going quite yet - - nor are the fish really looking up. We need the water to hit the 60F mark - - once we get there - - watch out! The Lehigh should light up big time. We've been finding lots of fish in all the likely looking spots, but they have all been underneath on either brown buggers or our maddie wet. A few maddie wets have even been retired due to compromised hooks, ie., bent! With the wet fly taking top trout-getter honors, you can pretty much assume the large march browns are about to get going. Decent releases and subsequent flows, and good weather should only prolong the good fishing. Bow caught on a bugger. Working a quality looking run. This weekend should provide another great opportunity to get out on the Lehigh. With good angling friendly flows from the dam, down thru the gorge and into the lower river below Palmerton we plan to be on the water. The weather appears to be looking good as well. 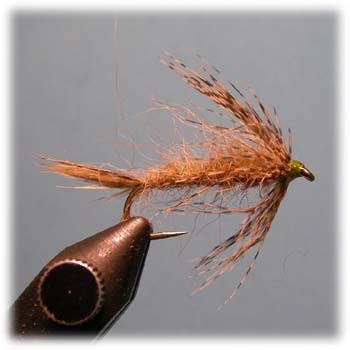 Look for the march browns to be popping, along with tan caddis, and maybe even a few leftover hendricksons. The fish should be looking up, especially in the softer water areas - - the tailouts, pools, and bank eddies. Underneath try a big march brown numph, and/or a stone fly imitation. Look for a report toward the beginning of next week. Don't forget, if you are interested in a Lehigh float - - don't hesitate to email us. Sorry for the late report, but our site got so many hits in April we blew thru our bandwidth quota for the month. Going forward we are going to most likely have to cut back on the number and quality of the images posted in order to lessen the bandwidth usage each time the site gets a hit. Anyway, enough of the tech garbage - - lets get onto the Penns report. For the nymph fisher, the Penns-Zee is the place to be. Most fly anglers out there really look forward to dry fly, but if you really want to get down to it - nymphs flat-out catch fish and Penns is exhibit A for this technique. This past weekend was no different. By far the hot fly for us was our march brown nymph. We have written extensively about this pattern in our Reports and you can check it out on our patterns page. Our intention of the pattern is to imitate a shore/soft-water bound migrating march brown nymph becuase that is what they do about this time of year - - but the pattern can also imitate stones, or any other large steno nymph. So we are killing many birds with this nymph. Other subsurface patterns that produced were a lafontaine style caddis pupa, varigated stone and a wired stone. The overall key was to get the fly down deep, and quick. We weight our ties with quite a bit of lead when we tie them, however we regularly added a couple of nice-sized split shot to get it down even more. As for surface action - - with the high-sun there was not any during the day, but in the eve there was a little bit. The hendrickson spinners should be around for the immediate future, so stock-up on your red-browns. A trio of quality subsurface caught browns. As of now, look for Penns to be in great condition come this weekend barring anymore significant rain.